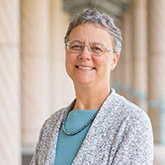 Suzanne Hawley is a professor in the Department of Astronomy. She previously served as chair in the department from 2006-2011. Her research is primarily in stellar astrophysics, particularly in the areas of magnetic activity, flares, low mass stars, brown dwarfs, variable stars, star clusters and galactic structure. Hawley has been the director of the ARC 3.5-m Telescope at Apache Point Observatory since 2005, and serves on several national committees devoted to the construction and oversight of the Large Synoptic Survey Telescope, the major NSF Astronomy project designed to image the night sky every few days for ten years. A member of the UW Astronomy faculty since 2000, Hawley is a fourth-generation Washingtonian. She was born in Seattle and graduated from Ballard High School. She completed her Bachelor of Science in Physics at Harvey Mudd College, and both her Master of Arts and Ph.D in Astronomy at the University of Texas, Austin, followed by postdoctoral work as a Hubble Fellow at the Lawrence Livermore National Laboratory. She previously taught at Michigan State University. As of September 1, 2016, Hawley is the divisional dean for the Natural Sciences.